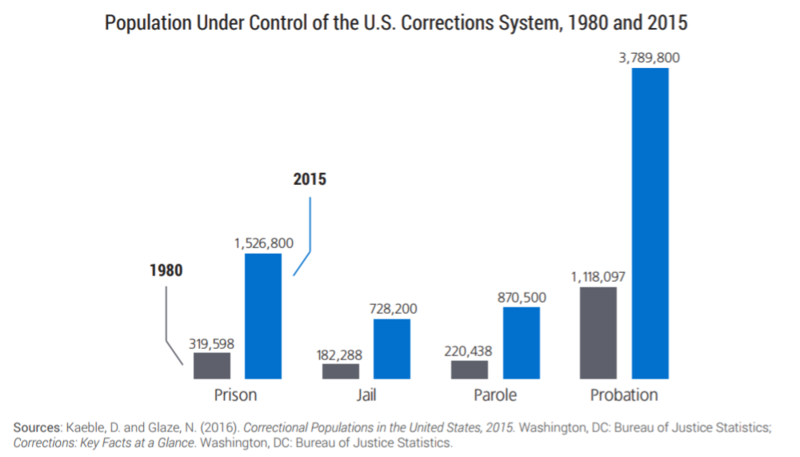 Beginning in the 1970’s, incarceration rates in the United States began to rise drastically, quickly resulting in the country becoming the world's leader in incarceration. Within forty years, roughly 2.2 million Americans were placed behind bars. In those forty years, state budgets have had to adapt precariously and quickly to the surging fiscal responsibility placed upon them by this growing trend. State legislatures have slowly begun to realize the budgetary consequences of mass incarceration as well as the benefits of early release and other penal reforms. This change in priorities was not born from the demands of well-intentioned policymakers, but a need to fill revenue shortfalls faced by nearly half of the states in the US as of 2017. It is not difficult to understand that increased spending on one government function leaves other functions with less available money for improvements or budgetary emergencies. The Center on Budget and Policy Priorities calculated that if the United States was spending the same amount of money on incarceration that it spent in the 1980’s, there would be $28 billion (adjusted for inflation) left to fund other projects throughout the country. The largest cost to taxpayers in regards to reducing prison expenditures is the prisoners themselves. On average, it costs roughly $33,274 a year to house a single inmate in a state prison. Simply put, the best way to save money is not through pinching pennies on prison services such as food, healthcare, recreation, and other human services but instead to reduce the total number of individuals entering prison. Reorganizing our state fiscal priorities to be more focused on long-term investments such as human capital, infrastructure, and finance instead of corrections will pay large sums in the long term and strengthen various state reserves to cover budgetary shortfalls that may arise. Strengthening state budgets through penal reform must be born out of practical and feasible policy choices that address the root of the problem. Depending on the institution or individual, the root causes of prison overcrowding include increased sentencing terms, rising number of arrests for nonviolent crimes, and various underperforming rehabilitation and reintegration programs. This further complicates the problem of finding the correct policy solution, being that there isn't a comprehensive penal reform policy to address both the front and back end of criminal justice reform. Due to the difficulty of implementing a one-size-fits-all policy reform, legislators and policymakers must instead look at individual sets of policy that can be passed over a period of time, each being an effective revision of the current penal policy that in turn will strengthen various states' budgets. Thankfully, several states already serve as guides for such reforms; for example, California, both a leader in prison incarceration rates and penal reform policies, gives other state legislators foresight into what works and what doesn't. California was forced by the Supreme Court ruling of Brown v. Plata in 2011 to reduce its prisoner population. This has led to various ballot initiatives ranging from changes in felony sentencing, earlier parole hearings and youth sentencing reform. State legislators having a range of issues to work through allows for them to concentrate on a variety of policy prescriptions dedicated to individual, systematic problems instead of vast, comprehensive reforms that could be limited by controversial riders attached to the legislation. Riders are additional measures added to a bill that bog down the bill in such a way that it won’t be passed by the legislature. One policy prescription that state legislators can concentrate on is a frontend policy approach. The goal of this approach is to focus on improving the state budget by reducing the rate at which prisoners enter the criminal justice system. One of the ways this can be attained is through a reforming the way people are sentenced, specifically how these individuals wait for their court date to be set. Roughly 480,000 Americans sitting in jail have been charged with a crime, but are not actually convicted in a court of law. The median wait time for trial is 68 days, costing taxpayers $17 billion a year to keep perpetrators incarcerated while they await a hearing. According to the National Conference of State Legislatures, roughly three-fourths of these individuals are accused of nonviolent crimes such as low-level drug offences, traffic violations, or for being simply being unable to pay bail. Clearly, these individuals pose little risk to the general public. It simply does not make budgetary sense to keep individuals awaiting low-level criminal charges in jail for extended periods of time. At the end of their time in jail, many of these individuals end up being released without a charge or are sentenced to several hours of community service, resulting in the waste of millions of dollars a year to house “criminals” who pose no risk to society. To solve this, the usage of pretrial release in various states is a very practical approach. This policy aims to release defendants who have not yet been charged with a crime. These individuals would otherwise be sitting in jail awaiting their court date and subsequently may never be charged. Pretrial release policies stem the flow of low-level criminals entering the penal system and would not cost the state any money for the detainment of those awaiting trial. As an example, in 2011, the state of Kentucky decided that the policy of pretrial release was a method worth examining for its cost-effectiveness. They found that crimes committed by individuals released through pretrial release were 4% lower than the prior rate. This is due to the time that is spent conducting various risk-assessments for individuals and making sure that only qualified individuals are released. Other than a classic frontend approach such as pretrial release, an experimental backend solution gaining popularity within the United States is split sentencing, which splits the sentences of low-level and medium-level convicted offenders who are currently in prison. Essentially, criminals whose sentences are split are required to serve at least half of their sentences in prison, before being released under community supervision for the rest of their second term. The benefit of split-sentencing is that individuals who are deemed unlikely to recidivate are released back into their communities. This reduces the time a convicted individual spends in prison, thus cutting the amount of money that is spent housing them and freeing up space for individuals who are considered a greater danger to the public. Utilizing split-sentencing can be extremely effective for states that have already accumulated a large incarcerated population and are looking to reduce it with an efficient and viable policy solution. For legislators looking to sell this approach, a priority must be placed on the importance of public safety before placing an emphasis on budgetary savings. Politicians must create an appropriate risk-assessment plan for these individuals being released that deems them safe to re-enter the community in order to gain enough public support for such a measure. States utilizing a combination of a frontend policy approach such as pretrial release and a backend policy approach like split sentencing have the ability to significantly decrease the amount of money state governments spend on holding convicted and unconvicted individuals. 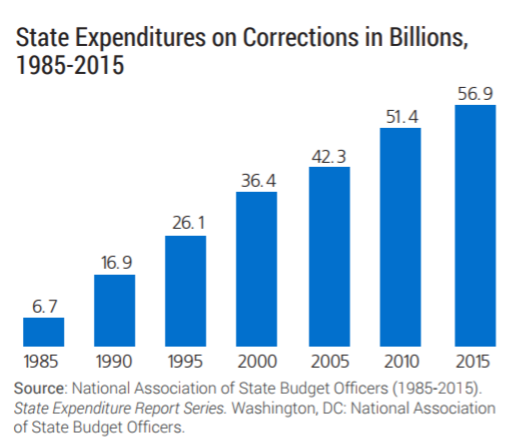 Correctional reform should be recognized by state budget offices for the reason that it would greatly alleviate the financial burden of prison systems, thereby allowing leftover funds to go towards other policy priorities. Ultimately, the world's largest incarceration state needs to start implementing policies that are economically sound, not ones that create inefficiency and injustice.